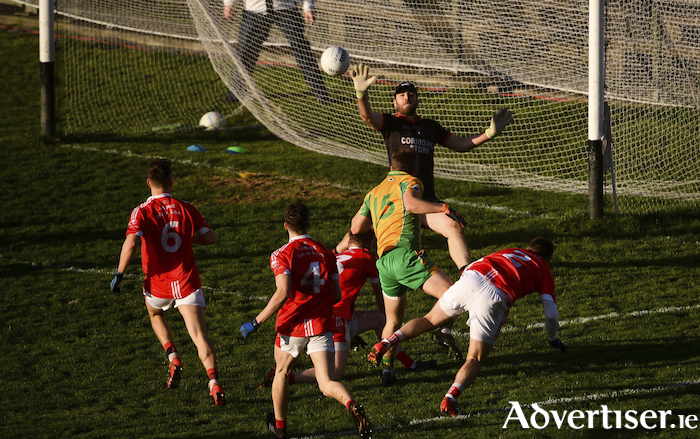 A dominant second half performance from Corofin saw them see off Ballintubber in the Connacht Club Senior Football Championship Final in MacHale Park on Sunday afternoon. The defending Connacht and All Ireland champions outscored the Mayo men by 1-8 to 0-4 in the final 30 minutes to run out four point winners and claim their ninth Connacht senior club title. The introduction of Ian Burke from the bench early in the second half proved to be a key moment in the game with Burke kicking 1-1 for his side within eight minutes of his introduction and swinging the game in his sides favour dramatically. Ballintubber went into the game as underdogs, but they didn’t let that tag weigh them down as the started the game in fine form with Cillian O’Connor and Alan Dillon both swinging over points from play inside the opening three minutes. Corofin got their first score six minutes in when Colin Brady bustled his way through down the left flank before firing over the bar. Ballintubber stuck to their game plan of choking up the their half of the field and looking to spring on the break and they went three points clear by the eight minute mark with O’Connor and Jason Gibbons tagging on two points from play. Ten minutes from the short-whistle Martin Farragher cut the gap back to two pointes with a well taken effort after some good play by Dylan Wall and five minutes later they plundered the first goal of the afternoon. Liam Silke played in Michael Lundy, but it looked like he had overcooked the pass and forced Lundy into a bad position near the endline, but the Corofin number 15 kept his composure and was able to beat his man before firing it to the net from close range to put his team into a 1-2 to 0-4 lead. Balliutubber responded brilliantly from this setback, with Alan Plunkett levelling it up from play and a minute later Jamsie Finnerty getting put in behind the Corofin rearguard by Brian Walsh and Finnerty expertly finished to the bottom far corner of the net to send his side in leading by 1-5 to 1-2 at the break. The lead didn’t last too long though as Corofin really hit the ground running early in the second half with Gary Sice pointing a free, followed by scores from play from Jason Leonard and Michael Farragher to leave it all square six minutes in. Burke was introduced not long after and with his first involvement in the action he grabbed Corofin’s second goal of the day after some good work by Sice, following a quick restart that was worked down the field at breakneck speed. Ballintubber did respond well with Cillian O’Connor pointing two frees - but crucially missing one in the middle of that run that could have levelled the game up. The Galway men then really took the game by the scruff of the neck with Burke pointing followed by two more frees from Sice and points from Kieran Molloy and Liam Silke to push themselves six clear with nine minutes left. Ballintubber kept plugging away and late points from Alan Dillon and Michael Plunkett cut the gap back to four in injury time, but it was too little too late for Kevin Johnson’s men as Corofin were able to see out the game and claim Connacht title number nine.